Discount(s) must be requested at time of reservation and cannot be applied to existing reservations. Discounts and special offers are not redeemable for cash. Not available Memorial Day weekend, the week of July 4th, Raspberry Days, Pioneer Day, or Labor Day Weekend unless otherwise noted. Discounts may not be available on all properties. Discounts may not be combined with other coupons or discounts unless otherwise noted. Booking rules, minimum days, and Rental policies apply. Discounts cannot be applied retroactively. Book one of our beautiful Cabin's or Condo's in June and receive 20% off your entire stay! Not valid with any other specials or promotions. Come stay and play in May this year and received 30% off your stay. Not valid with any other specials! One bedroom Harbor Village Inn building condo deal at 60% off. Must stay for 2 or more consecutive nights. This price does not include taxes, processing fee and non-refundable deposit/insurance. It can't be used on a upgraded room and can't be combined with any other specials or deals, some exclusions may apply. Stay 2 nights or more in one of our cozy cabins and get 30% off your entire stay. 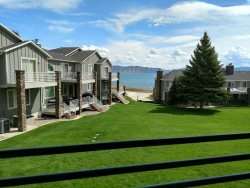 Enjoy beautiful Bear Lake this fall for 40% off 1 Night in our 1 bedroom condo's. This price does not include taxes and fees and cannot be combined with any other offers.